The changing world in which we live. Why the emphasis on coaching for organizations. Building a coaching culture in your organization. The journey towards a coaching culture. Why some leaders and managers are reluctant to be coached. Encouraging managers to coach their colleagues. Dealing with more complex coaching incidents and knowing when to hand on to someone else. Application of Presupposition in motivating change. Action learning as a complement to the coaching ethos. Simple Techniques to get you started. 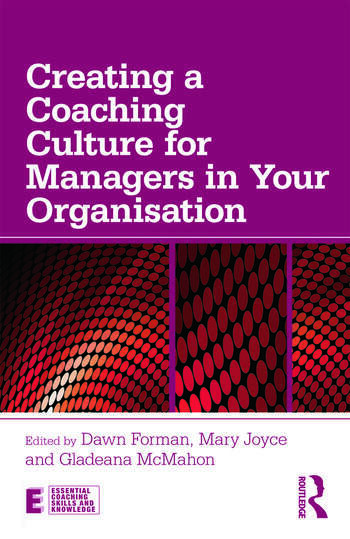 Measuring the success of your organisation’s achievements through coaching. When to use an external coach and how to ensure credibility and appropriateness of your external coach. Dawn Forman has worked as an independent executive coach and consultant for five years and is an adjunct professor at Curtin University and Auckland University of Technology, and a visiting professor at Auckland University of Technology. Mary Joyce is an executive coach, leadership consultant and Director of Leading Minds Consulting. She teaches the psychodynamics of groups and organisational behaviour, and is visiting tutor at Salomons, Canterbury Christ Church University. Gladeana McMahon is one of the leading coaches in the UK. She is a co-editor of the Essential Coaching Skills and Knowledge series.